Deputy Gabe Dawson has had his eye on prosecuting attorney Elle McCoy for years. But the smart, sassy redhead is immune to his legendary charm and good looks--until Gabe is shot on the courthouse steps protecting Elle from a vengeful domestic extremist. This is an exciting small town romantic suspense. The romance between a small town DA and Sheriff's deputy is both sweet and incredibly intense. Despite years of mutual attraction, Elle and Gabe have only ever seemed to hurt each other. Things begin to change when Gabe puts himself between Elle and a terrorist’s bullet. Small town domestic terrorism is a fresh and interesting subject for a novel. Despite the slightly preachy “Blue Lives Matter” focus of the story, I found this a fascinating topic and I was intrigued by the problems facing law enforcement in this book. The romance is hot. I love second chance love stories and I really enjoyed watching Gabe and Elle’s relationship move from gawky teenage crush to an adult partnership. Elle is a strong female lead and Gabe is an irresistible, roguish leading man. I enjoyed Gabe’s slightly terrifying family and the relationships between the brothers. The plot becomes slightly convoluted near the end with possibly too much happening and too many characters introduced in a very short period of time. But the action is exciting. Knowing the perpetrators’ perspectives from the outset is unsettling and the known threats create an intense game of cat and mouse for readers. This is a great story. I haven’t read the first in the series, so it works well as a standalone and I will certainly be looking out for the next book as it is released. 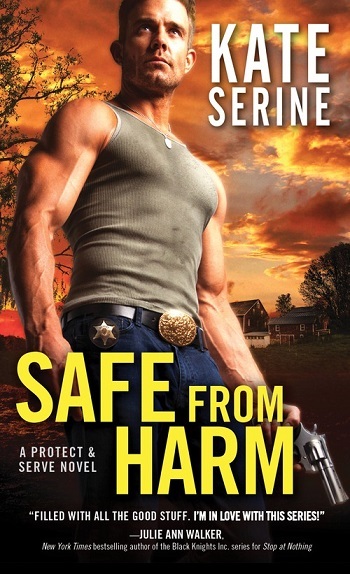 Reviewers on the Wicked Reads Review Team were provided a free copy of Safe from Harm (Protect & Serve #2) by Kate SeRine to read and review.